The incentives are very small potatoes in the overall scheme of things. The WTP is an $11 billion plus project (so far); the semi-annual SC incentives have been in the $1-5 million range. But it is the correct signal for the government to be sending to a contractor. It’s also interesting how the incentives have been fiddled with during their brief existence, as shown in the following table. To keep things simple, the table excludes incentive program components that are not related to SC, e.g., cost performance incentives. Note that the dollar amounts shown are the maximum Bechtel can earn; published payouts to date have been less than the maximums. From July 1, 2012 to June 30, 2013 the contract included a project management incentive (PMI) component. Nuclear Safety and Quality Culture items (the Corrective Action Program, Employee Concerns Program, Differing Professional Opinion process, Safety Conscious Work Environment (SCWE) and Integrated Safety Management Systems) were 20-30% of the PMI. Starting July 1, 2013 and continuing to the present a section was added to the incentive plan covering Self-Analysis/Assessment/Discovery/Action. This basically means Bechtel will be rewarded for identifying and fixing its problems before outsiders tell them to. The contract does not characterize this activity as part of SC but we do; fixing problems is an essential artifact of a strong SC. In addition, the attributes under this section, including transparency and organizational learning, are also attributes of a strong SC. Another new section on Environmental, Safety and Health is mostly about industrial safety but includes promoting a robust NSQC embracing INPO principles, including a SCWE. The section on the Quality Assurance program includes supporting an effective CAP and, starting July 1, 2014, maintaining a robust quality culture. For starters, let’s give credit where credit is due: Huzzah to DOE and Bechtel. For a long time, we have been saying that organizational reward systems should include SC components. Safety slogans and empty mantras are just that—empty. If a government agency, or a nuclear plant owner, or a board of directors, or any other overseer truly values SC then they should put some money where their mouths are. Enough cheering, let’s put our reality hat back on. Could Bechtel (or any other contractor) game the incentive system to get rewarded without actually creating a strong SC? Possibly. Who would you bet on: government bureaucrats or a clever, financially motivated contractor? But an official incentive plan like the one described above is a good start. Now that DOE has figured out how to design a contract that aims to motivate a contractor to strengthen its SC, let’s turn the spotlight back on DOE itself. How does DOE do on transparency, extent of condition and other SC attributes? Not so good. Over the last few years we have been reporting on the DOE effort to evaluate SC at other (i.e., non-WTP) sites to determine if WTP SC issues exist elsewhere. We saw foot-dragging, an unorganized SC assessment program and deliberate opacity in the resultant reports. DOE can and should do better. * The WTP Performance Evaluation and Measurement Plans used in this post are available here. For prior related posts click on the Vit Plant label below. The International Atomic Energy Agency (IAEA) recently conducted a four-day workshop* on leadership and safety culture (SC). “The primary objective of the workshop [was] to provide an international forum for senior managers to share their experience and learn more about how safety culture and leadership can be continuously improved.” (Opening, Haage) We don’t have all the information that was shared at the workshop but we can review the workshop facilitators’ presentations. The facilitators were John Carroll, an MIT professor who is well-known in the nuclear SC field; Liv Cardell, Swedish management consultant; Stanley Deetz, professor at the University of Colorado; Michael Meier, Regulatory Affairs VP at Southern Nuclear OpCo; and Monica Haage, IAEA SC specialist and the workshop leader. Their presentations follow in the approximate order they were made at the workshop, based on the published agenda. The major point is how individual performance is shaped by experience in the social work space shared with others, e.g., conversations, meetings, teams, etc. Haage described the desirable characteristics of such “shared space” including trust, decrease of power dynamics, respect, openness, freedom to express oneself without fear of recrimination, and dialogue instead of argumentation. The goal is to tap into the knowledge, experience and insight in the organization, and to build shared understandings that support safe behaviors and good performance. In a visual of an iceberg, shared understanding is at the bottom, topped by values, which underlie attitudes, and visible behavior is above the waterline. Haage covered the basics from various IAEA documents: “management” is a function and “leadership” is a relation to influence others and create shared understanding. Safety leadership has to be demonstrated by managers at all levels. 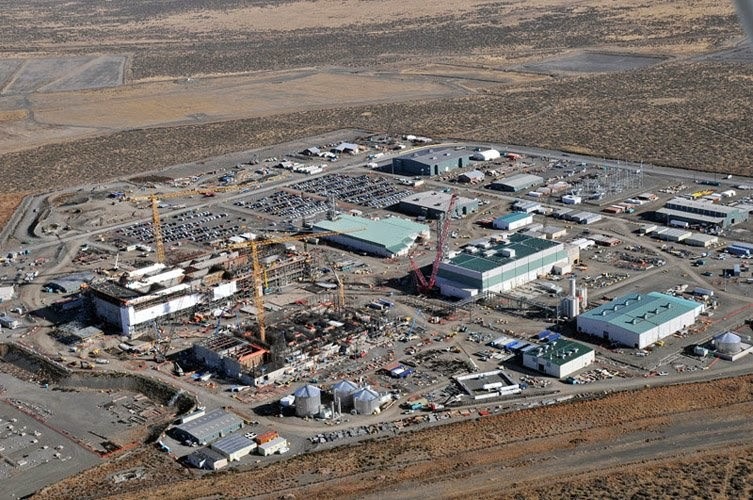 There is a lengthy list of issues, challenges and apparent paradoxes that face nuclear managers. Carroll covered the need for leaders who have a correct view of safety (in contrast to, e.g., BP’s focus on personal safety rather than systemic issues) and can develop committed employees who go beyond mere compliance with requirements. He provided an interesting observation that culture is only one perspective (mental model) of an organization; alternative perspectives include strategic design (which views the organization as a machine) and political (which focuses on contests to set priorities and obtain resources). He mentioned the Sloan management model (sensemaking, visioning, relating and implementing). Carroll reviewed the Millstone imbroglio of the 1990s including his involvement, situational factors and the ultimate resolution then used this as a workshop exercise to identify root causes and develop actionable fixes. He showed how to perform a stakeholder assessment to identify who is likely to lead, follow, oppose or simply bystand when an organization faces a significant challenge. This presentation had an intro similar to Leadership followed by a few slides on management. Basically, the management system is the administrative structure and associated functions (plan, organize, direct, control) that measures and ensures progress toward established safety goals within rules and available resources and does not allow safety to be trumped by other requirements or demands. Culture is of interest to managers because it supports the hope for invisible control with less resistance and greater commitment. Culture is a perspective, a systemic way to look at values, practices, etc. and a tacit part of all choices. Culture is seen as something to be influenced rather than controlled. Cultural change can be attempted but the results to not always work out as planned. The iceberg metaphor highlights the importance of interpretation when it comes to culture, since what we can observe is only a small part and we must infer the rest. This is a primer on SC definition, major attributes and organizational tactics for establishing, maintaining and improving SC. One key attribute is that safety is integrated into rewards and recognitions. Meier observed that centralization ensures compliance while decentralization [may] help to mitigate accident conditions. A systemic approach describes the interaction between human, technical and organizational (HTO) factors. Haage noted that the usual approach to safety analysis is to decompose the system; this tends to overemphasize technical factors. A systemic approach focuses on the dynamics of the HTO interactions to help evaluate their ability to produce safety outcomes. She listed findings and recommendations from SC researchers, including HRO characteristics, and the hindsight bias vs. the indeterminacy of looking ahead (from Hollnagel). This short presentation lists the SC Challenges faced by workshop participants as presented by groups in the workshop. The 16-item list would look familiar to any American nuclear manager; most of you would probably say it’s incomplete. Cardell’s approach to improving performance starts by separating the hard structural attributes from the softer cultural ones. An organization tries to improve structure and culture to yield organizational learning. Exaggerating the differences between structure and culture raises consciousness and achieves balance between the two aspects. Culture comes from processes between people; meetings are the cradle of culture (this suggests the shared space concept). Tools to develop culture include dialogue, questioning, storytelling, involving, co-creating, pictures, coaching and systemic mapping. Cardell suggested large group dialogs with members from all organizational elements. This is followed by a cookbook of suggestions (tools) for improving cultural processes and attributes. It’s hard to avoid being snarky when dealing with IAEA. They aim their products at the lowest common denominator of experience and they don’t want to offend anyone. As a result, there is seldom anything novel or even interesting in their materials. This workshop is no exception. The presentations ranged from the simplistic to the impossibly complicated. There was scant reference to applicable lessons from other industries (which subtly reinforces the whole “we’re unique” and “it can’t happen here” mindset) or contemporary ideas about how socio-technical systems operate. The strategic issue nuclear organizations face is goal conflict: safety vs production vs cost. This is mentioned in the laundry lists of issues but did not get the emphasis it deserves. Similar for decision making and resource allocation. The primary mechanism by which a strong SC identifies and permanently fixes its problems (the CAP) was not mentioned at all. And for all the talk about a systemic approach, there was no mention of actual system dynamics (feedback loops, time delays, multi-directional flows) and how the multiple interactions between structure and culture might actually work. Bottom line: There was some “there” there but nothing new. I suggest you flip through the Carroll and Cardell presentations for any tidbits you can use to spice up or flesh out your own work. A Compendium was sent to the attendees before the workshop. It contained facilitator biographies and some background information on SC. It included a paper by Prof. Deetz on SC change as a rearticulation of relationships among concepts. It is an attempt to get at a deeper understanding of how culture fits and interacts with individuals’ sense of identity and meaning. You may not agree with his thesis but the paper is much more sophisticated than the materials shared during the workshop. 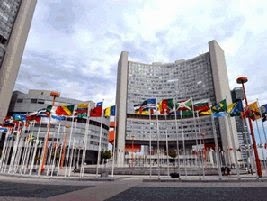 * IAEA Training Workshop on Leadership and Safety Culture for Senior Managers, Nov. 18-21, 2014, Vienna. The presentations are available here. We are grateful to Madalina Tronea for publicizing this material. Dr. Tronea is the founder and moderator of the LinkedIn Nuclear Safety Culture forum. This book* presents the author’s model for organizational and managerial success, focusing on “soft” or qualitative factors. Karlgaard is the publisher of Forbes magazine and had access to many well-known, successful firms and their executives for his research. The book is aimed at managers in dynamic, highly competitive industries but it contains many observations about successful organizations that can be applied in the nuclear industry and to safety culture (SC). Karlgaard’s model of a business is an equilateral triangle—its base is strategy, one edge contains the “hard” factors and the other edge the “soft” factors. All are necessary to create long-lasting organizational success but the first two are quickly dealt with in this book. An appropriate and effective strategy is indispensable for survival and success. Strategy considers markets, customers, competitors, substitutes and disrupters (usually technological). For nuclear, we should add regulators and the existence and actions of anti-nuclear factions. This is not what you might think it is, viz., a high IQ. Business smarts are the ability to learn through adaptation, a process that can be accelerated by searching out mentors, seeing failures as learning opportunities and adapting ideas from outside one’s own field. (p. 80) A culture that punishes people for mistakes and refuses to consider ideas from outside is only making it tougher to succeed in the long-run and avoid surprise disruptions. Smart companies run a little bit scared, a behavior observed in High Reliability Organizations. Most companies use teams to attack major problems or develop initiatives. The culture must value team members with differing views and divergent perspectives. Tactics include seeking common ground that all employees share, e.g., the desire to learn more and be better, and promoting “good conflict” that focuses on business issues, not personalities. Leaders should set clear expectations of high performance for teams, push them hard and keep them slightly scared so they remain alert and avoid complacency. Taste is the part of product design and presentation that ties function and form with meaning, i.e., the associations customers experience with a product. Think how Apple product users feel smarter than the rest of us. Taste is definitely important for consumer products but I am unable to relate it to SC. A “story” is how a company or organization describes its past, its current purpose and its future aspirations. The story can, among other things, strengthen culture by encouraging collective responsibility for organizational performance. Articulating the story is an essential duty for senior managers, i.e., it is a responsibility of leadership. Soft edge skills are required for creating long-term differentiation in competitive markets; they don’t all have to be razor-sharp to succeed in the nuclear industry. However, two attributes of the soft edge, trust and story, are essential to building and maintaining a strong SC. For years, we have been saying that trust is a key input into SC strength. Trust arises from applying basic management principles articulated by Peter Drucker, viz., meaningful work and respect for the individual. Trust has to be earned and cannot be demanded. The tolerance for honest mistakes suggests a “just culture.” One way to build trust is by publishing reports, e.g., SC assessment findings, in a format that makes them easy to understand and allows performance comparisons across different organizational units. A credible, understandable story is also essential to build a culture of community and shared responsibility. And a story is not really optional for an organization. If top management doesn’t provide one, then other organizational elements (departments and/or members) will. Most people want to know why their company exists, where it’s going and how they will be affected. The advice on smarts and teams is also useful if one truly wants to build a learning organization. Bottom line: You don’t have to run out and buy this book but don’t be surprised if you see on the business bookshelves of colleagues or friends. 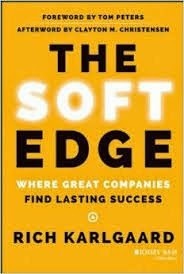 * R. Karlgaard, The Soft Edge: Where Great Companies Find Lasting Success (San Francisco, CA: Jossey-Bass, 2014). For more information, see Karlgaard’s website.